Daisy brings considerable practical experience to the task of caring for babies and mothers. She is married and the mother of two fantastic (and busy!) twin boys. 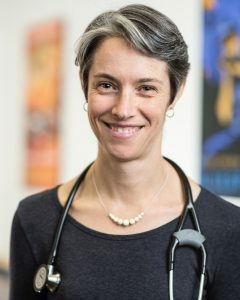 She received her Bachelor of Science in Nursing from McMaster University, and her work as a nurse in the North means that she is trained in people-centred medicine, focusing on the unique individuals who need medical care. Add to this her remarkable upbringing in a wooden boat shop, her prior life as a certified whitewater canoe instructor and northern river guide, and her secret wish to sail around the world someday and you get a well-rounded, approachable, and expert medical practitioner. In her few private moments, Daisy loves to cross-country ski, and cycle-commutes whenever she is not on call. She strives to get outside with her family as much as possible, whether in the garden or on a canoe trip. She loves the tranquility that comes from being outside. Equally as much, she loves her work and feels privileged to get to participate in the building of families. Like David and Colleen, she finds herself smiling at the end of every day.